Some of the work from my first two weeks. I recently returned from the first two weeks of my residency in the Mojave Desert. While I had planned a few things I wanted to work on including some larger canvas sizes, the desert had other things in mind - including one of the largest snowstorms to hit the desert in a while. A wild experience to see and paint. I ended up working smaller on location to be able to quickly get at some of the big color relationships, and supplemented those with lots of drawings that can add to the color sketches when I develop larger work. I’ll be back out to the Mojave for another two weeks later in the year, and will present an exhibition of the work in the not-too-far future. Painting at dusk. The pond at this oasis was man-made, but is fed by natural water sources. 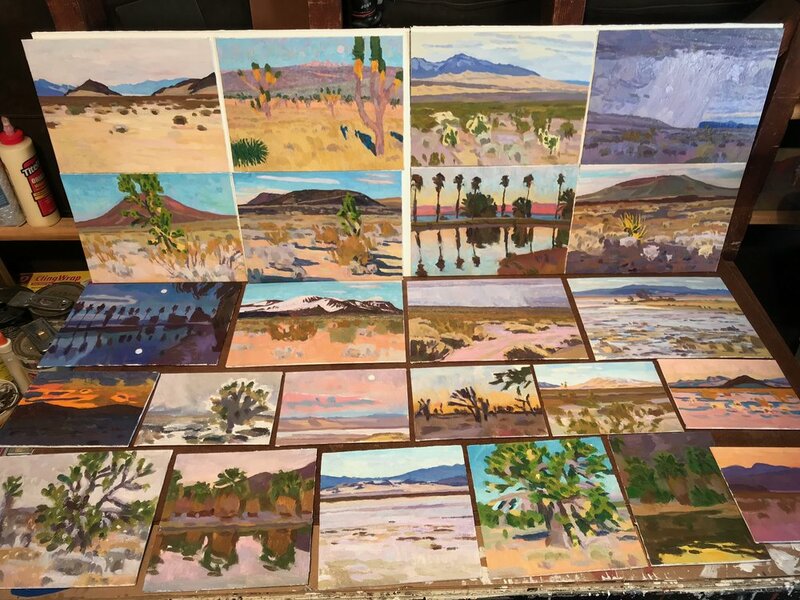 Painting in a desert wilderness surrounded by cinder cones. The painting from the location above; the color of a Mojave yucca among the lava rock is so fun. Full moon and reflection at the oasis. I witnessed some pretty spectacular weather - this was later in the day as part of the snowstorm traveled across Devil’s Playground. Cinder cones at sunset. The end of two weeks.